Welcome to our world of hostas! Shopping for just the right hosta can be a bit of a task with the thousands of varieties available these days. 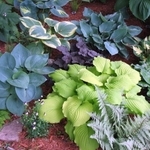 We have grouped hostas into categories to help you in your search. Have fun shopping and remember that our disease-free plants are shipped in pots for free!